Back in the days when this car company was called Daimler Chrysler Benz, The Dodge Magnum, and Chrysler 300 were using the Mercedes W220 designs which Chrysler designated the LX platform. This wagon uses Mercedes-Benz w220 S-class front suspension, and the E-class 5-link rear suspension. It uses the Mercedes W5A580 trany, rear diff and the ESP system. This is the same design used in the Mercedes S430, S500 S600 and the S55 AMG. There are many more Mercedes design influences including the exhaust system, dual fuel tanks, battery location, electrical controls, firewalls, floor pan, and interior space allocation. 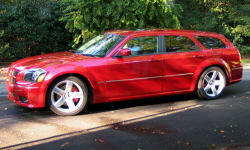 If you want the ride and handling of a Mercedes, but don?t want to pay the price, try a Dodge Magnum. Why the 2005 Dodge Magnum? The Magnum is not a cookie cutter design. For a heavy wagon, the Magnum is very responsive and has impressive performance especially when passing on two lane roads. This wagon uses Mercedes-Benz w220 S-class front suspension, and the E-class 5-link rear suspension. It uses the Mercedes W5A580 trany, rear diff and the ESP system. With the length of 198 inches, it provides a very smooth ride over today's interstates. Since I am a sales engineer, I travel the south east. In other work cars, I have usually had to replace the audio systems including one car equipped with the Bose system. This wagon is the first car I that I didn't feel compelled to replace the system. The Boston Acoustics system was very balanced. I am 6'2". This car came equipped with power petals. This is the first car that I have had to move the seat slightly forward. I had plenty of room for my legs. On the safety side, the windshield was well forward away from the drivers face. The R/T came with a tilt and telescopic steering wheel. The ?bun? warmer seat were well padded, supportive and comfortable. Why Not the 2005 Dodge Magnum? After 230,000+ miles, the only unusual problems I have had include a HEMI "tick", defective instrument panel, and a shifter issue. The dealer replaced the head under warranty, and they picked up the price on a new instrument panel. (I had to pay the labor) I solved the shifter issue myself. If I had not had the extended warranty, my cost could have exceeded $2000.00. I have a 1995 Honda DeSol that I "toy" with, that new, cost one third the price of the Magnum, but is now worth twice as much as the Magnum used. In the last year, I am pleased to see the prices of the R/T version finally go up. It comes equipped with twin zone temperature controls. In German fashion, using the system in the auto mode is very simple, but trying to use the system in the manual mode is very confusing. As an example, trying to get fresh outside air without using the AC compressor can be a challenge. Compared to other cars, the cruise control is located where theturn signals should be. The HEMI engine uses 16 spark plugs.The oil MUST be changed every 3000 miles.The battery is located in the rear body compartment. The owner?s manual specifies mid or high grade fuel which can be costly. For balance and handling, the Magnum has dual fuel tanks which could complicate fuel delivery. In German form, the dual exhaust system is very complicated which could be costly to repair. The dash and interior surface is very plain and there is too much "hard" plastic used in the interior surfaces. The seat and carpet colors are drab and unimaginative. Overall if Chrysler had offered an updated 2017 Magnum R/T or later version of this car, I would purchase another one. Not the best, but not bad.